Proper golf cart battery maintenance will keep your batteries running strong and can save you lots of money. Replacing golf cart batteries is an expensive cost to owning and operating a golf cart - almost $700. Normally you can't just replace one golf cart battery. For example you can't put in one new battery with 5 old batteries. You need to buy 6 new batteries. So the goal is to keep your used golf cart batteries around for as long as possible. 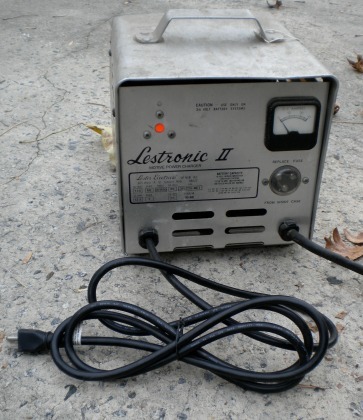 There are several aspects to help keep your batteries working well and for a long time. Working with acid, hydrogen gas and electricity requires safety precautions to prevent burns and explosions - and they do happen. Wearing protective clothing like eye goggles and gloves are a start - but there's more. Golf cart battery chargers are one of the most common causes of fires in Peachtree City according to a report given to us at work by the local fire department. Check the golf cart battery wiring for loose wires, or frayed/broken cables. Replace frayed cables and reconnect the new cables. A loose or bad connection will cause a burned out post. Loose connections cause heat which then melts the lead. You can coat terminals with a thin layer of petroleum jelly or battery terminal anti-corrosion gel. Battery cables can be purchased easily on line. They are specific to your make, model and year of your golf cart. My son-in-law's golf cart suddenly stopped this winter while my daughter was out on the golf cart paths. The first place I checked was the golf cart battery cables - the cables and posts were so full of corrosion - it was a wonder it hadn't died sooner. Cables were melted onto the posts. Regular golf cart battery maintenance could have prevented this. Charging a deep cycle battery properly is also part of proper golf cart battery maintenance. Charging correctly will also help to increase the life of your electric golf cart batteries. There are just a few principles to learn, like do NOT let it completely discharge - meaning - don't let it completely run out of juice. It is possible to run the batteries down so far, that they won't even take a charge. When you see the battery charge indicator light flashing because you're almost out of power - this is NOT a good thing. 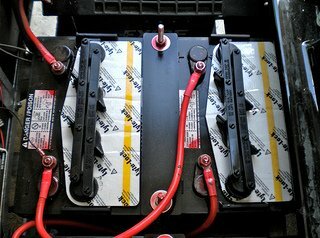 Over or underwatering electric golf cart batteries can damage your batteries and shorten the life of your deep cycle batteries. Correct watering is important to golf cart battery maintenance. You need know how to check battery water levels, what water to use and how frequently the cells need to be checked. 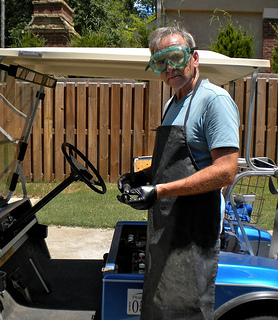 Find out what common mistakes new golf cart owners make and how to prevent them. Wouldn't you want to prevent corrosion from building up on your golf cart batteries in the first place? 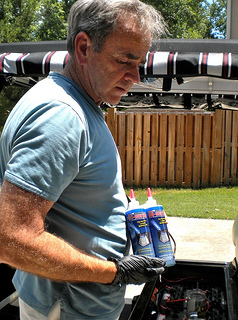 Quit spending your time cleaning the terminals and cables with these golf cart battery covers. 1. Keeping your golf cart batteries for a long time and replacing them less often? 2. 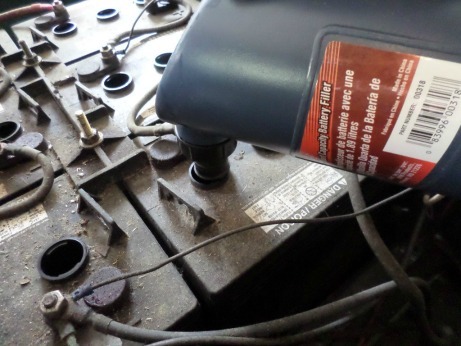 Reducing the amount of corrosion that builds up on battery terminals? Find out what Terry Felner from Thermoil has to say about making golf cart battery maintenance alot easier. Battery hydrometers measure the specific gravity of the electrolyte solution in your golf cart batteries. 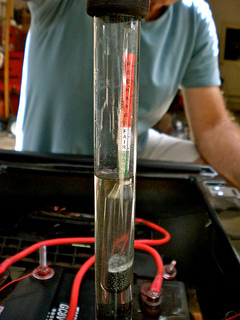 The higher the specific gravity the higher the state of the charge of the batteries. However there is a "right time" to test and a "wrong time" to test to get an accurate reading. Find out what condition your batteries are in - good, weak or replace - with this simple test. 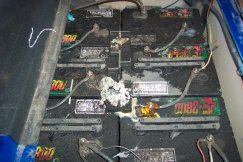 Have your batteries sat unused for several months? After batteries have sat for a long period of time they will lose their charge. How long it will take for them to "die" depends on the age of the battery and the temperature. The worst thing you can do to your golf cart batteries is to allow them to sit in a less than fully charged state for a few months. If they have sat all winter and have lost most of their charge, your regular charger may not detect enough voltage to activate. If you don't use your golf cart in the winter, try to check it and fully charge it at least once a month. Go from Golf Cart Battery Maintenance to Golf Carts Etc.